This particular statement piqued my interest. “Three times as much?” I asked out of curiosity. But the jolly Chia had already moved on to greet some other customers. After quickly purchasing a Neo taco, I rushed all the way back to my neohome with a new thought in my head: Why would Neopian Fresh Foods restock three times more than usual when I never see any other stores do so? For days I was obsessed with this intriguing question. Why only Neopian Fresh Foods? Then the answer came to me! Somewhere out in the wild of Neopia, there had to be some extreme consumers – consumers who... well... consumed foods in such large proportions, that the fresh foods shop had to rush to keep up! They were the ones who caused the skyrocketing of food demand! After a few more days of traveling Neopia and doing some research, I have compiled a list of the likely suspects. Turmaculus, titled “The King of all Petpets,” lies asleep most of the day in Meridell. All day long, a racket is heard as numerous sneezes, bells and pots and pans are heard each causing discordant cacophonies in their own ways in a *usually* futile effort to awaken him. However, Turmaculus, despite all this inharmonious noise, only wakes up to eat petpets one hour of the day. Even numerous, small petpets can’t possibly tame the hunger of this gargantuan beast. This leaves me a bit suspicious. If Turmaculus can only eat petpets for one hour a day, wouldn’t he be starving? A creature with such enormous proportions as he has would need to spend more than just one hour feeding. And what happens if no one decides to come by and try to rouse him from his sleep? He’s left famished. The point is, if Turmaculus is responsible for late-night thefts from Neopian Fresh Foods, the increase of restocking would only make sense! It lures more customers, produces more business, and earns more neopoints to cover for the loss that occurs each night. Well, maybe that’s just what she wants you to think. 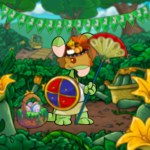 Perhaps sometime during the day, when most Neopians are all crowding at the Chocolate Factory waiting for a restock or lining up at the Post Office hoping for a stamp, the Soup Faerie sneaks away to Neopian Fresh Foods where she purchases piles and piles of ingredients for her different soups. Who knows? She may even buy some for herself. Charity can be famishing, you know. As she is a swamp witch, first impressions may suggest that Sophie spends her time casting spells on trespassers to her swamp or idling away on her rocking chair, reading a book on magic charms. Actually, Sophie spends a good part of her day concocting weird, nose-wrinkling stews in her big, black cauldron. Once again, ingredients for stews don’t just appear out of mid-air. In fact, nothing really does appear out of mid-air, but that’s beside the point. I can almost bet that Sophie sends her magical staff to fetch all her ingredients from the Spooky Food stall located in the Deserted Fairground. Now if this much is true, you can bet that Spooky Food was getting a lot, and I mean a LOT of business from Sophie alone. Sales were flying, profits skyrocketing... they were swimming in neopoints. With more and more neopoints, they could afford to lower prices, further attracting more and more Neopian customers. Neopian Fresh Foods, not wanting to be outdone, decided that the best way to draw customers was to restock thrice as much as before, so people didn’t have to waste their precious time waiting around a stall for a few pieces of food. This attracted more customers, and Neopian Fresh Foods decided to keep it that way. Every day, thousands of Neopians try their hand at feeding the Skeith in hope of a spiffy new avatar to add to their prized collection. Some succeed, but the majority goes home empty-handed, only to return the next day with renewed spirits, determined to try again. Now all these jellies and cakes have to come from somewhere. And because there certainly isn’t such a thing as a Jelly World (I mean how silly is that? ), the jellies MUST have come from Neopian Fresh Foods. With so many players, these jellies have to be bought in large shipments, many times a day. That probably explains the absence of jelly in the actual store. It all adds up! However, regular customers to Neopian Fresh Foods were disappointed when they realized that their favorite produce shop didn’t carry jelly on their shelves anymore. To appease infuriated shoppers, Neopian Fresh Foods decided to increase its stocking rate. This way, the customer’s anger might be soothed by the fact that they didn’t have to wait as long for a restock, and instead, could go try their hand at Faerie Bubbles or Turmac Roll with their spare time. The shock and sudden appearance of the Grundo Leader coming to steal your food is enough to put you into a coma, but again, that is irrelevant. The point is, with so many innocent Neopians falling victim to this dirty thief, food demand shoots up, off the charts! Neopians want their food back, so they must purchase it again. Civilians buy extra food in desperate hope that the Grundo Leader will steal the excess grub instead. The demand never ends! With all this food demand, the only thing that Neopian Fresh Foods could do was to increase the restocking rate! Don’t you see how it all fits together nicely? All Neopians who have heard about the Esophagor have learned to associate it with words like “food” and “glutton.” Rightfully so, this ravenous creature knows not the meaning of “full,” much less “bloated.” All day long, the Esophagor orders poor Neopians around to bring it all manner of spooky foods in exchange for information. Now between Sophie and the Esophagor, you can bet that they make up a hefty amount of profit for Spooky Food. As mentioned before, Spooky Food could now afford to lower prices and upgrade their shop, drawing more and more happy shoppers. With frightening competition, it only makes sense that Neopian Fresh Foods would restock their shelves three times as much as before. With Sophie AND the Esophagor, they had no choice. “King Skarl has gone to feast on some Turkey and Potato Dinner. You should try back in an hour or so. Aha! A full stomach! Are you starting to see where I’m going here? Now we all know that Skarl is royalty. My question is: do you honestly think that “royalty” will settle for the crude, bland taste of Merifoods? No, it won’t, and neither will Skarl. When Skarl gets back, however, he is in no better mood than before. Why? Because he had to sit uncomfortably as his servants carried him all the way back to Meridell under the hot, Neopian sun. Haven’t you always wondered why he always seems as grumpy as ever even though the note promises otherwise? It all fits together. The objective of the Gourmet Club is to feed your pet as many gourmet foods as you can. Obviously, you can see how much food demand there is in this one, gluttonous club. With so many members going out to purchase gourmet foods, there is no question as to why the Neopia Central food shop had to stock produce more frequently. I can bet that even just the avid and totally obsessed Gourmet Club members alone would create so much business for Neopian Fresh Foods, that stocking their shelves more often would become a necessity, not an option! And there you have it: A complete list of all the top suspects for extreme food consumption. Finally I can lie in peace on my bed knowing that I have overcome the puzzle that was thrown at me (or more like the problem I took upon myself, but whatever...). Well, folks, I guess I’m off to solve another Neopian mystery! I hope you enjoyed following along with my last mystery, but for now, farewell! I’m off to see Florg!